Emma needs a break from big-sister duty—or her summer will be anything but sweet! Emma is not thrilled with always having to rearrange her schedule so she can babysit her younger brother, Jake. Now Emma’s parents have broken some news that really threatens to push Emma over the edge—since Emma and Jake are going to the same day camp this summer, she’s expected to sit with Jake on the bus. Not only does this mean Emma can’t hang out with her friends, but she also has to comfort Jake—who has a serious issue with motion sickness. My name is Emma Taylor, but a few weeks ago I was wishing it was anything but! I was pretending that the little boy who was outside the school bus, wailing that he did not want to go to day camp, was not my little brother, Jake Taylor, and that those desperate parents who were bribing and pleading with him were not my parents, but rather some poor, misguided souls whom I would never see again. In fact, I was wishing that I was already an adult and that my three best friends and I—the entire Cupcake Club—had opened our own bakery on a cute little side street in New York City, where none of my three brothers lived. The bakery would be all pink, and it would sell piles of cupcakes in a rainbow of lovely colors and flavors, and would cater mainly to movie stars and little girls’ princess birthday parties. That is my fantasy. Sounds great, right? But oh, no, this was reality. “Emmy!” Jake was shrieking as my father gently but firmly manhandled him down the bus aisle to where I was scrunched down on my seat, pretending not to see them. I could literally feel the warmth of all the other eyes on the bus watching us, and I just wanted to melt away. Instead I stared out the window, like there was something really fascinating out there. “Emma, please look after your brother,” said my father. How many times have I heard that one? My older brothers, Matt and Sam, and I take turns babysitting Jake, but somehow the bad stuff always happens on my shift. My dad gave Jake one last kiss, reached to pat me on the head, and then dashed off the bus. I wished I could’ve dashed with him. The week?! I wanted to die, but instead I nodded and looked out the window again. I also wanted to kill Jake that moment, but it was only seconds later that his wails turned to quiet hiccups. Then he slid his clammy, chubby little hand into mine and squeezed, and I felt a little guilty. “It’s going to be okay, Jake,” I whispered, and squeezed his little hand back. He snuggled into me and looked up at me with these really big eyes that get me every time. It’s not the worst thing in the world to have a little someone in your life who looks up to you. I sighed. “Feeling better, officer?” Jake is big into law enforcement, so it usually cheers him up if we play Precinct. At least he wasn’t crying anymore. Paige gave him a pat on the head and then went to help some other kids get on the bus. But Jake wasn’t feeling better. I could tell just by looking at him. “I feel sick,” he said. Oh no. Jake isn’t one of those kids who fakes being sick. My mom always says on car trips that if Jake says he feels sick, we pull over, because he will throw up, 100 percent of the time. I rubbed his back a little and looked up to see if anyone I knew was getting on at this stop. My best friend and co–Cupcake Clubber Alexis Becker was going to the same camp, but her parents were dropping her off on their way to work. I fantasized about them driving me, too, and leaving Jake to his own devices. Ha! As if my parents would let me get away with that! At the very least, I did have our Cupcake Club meeting to look forward to later today. Just quality girl time, planning out the club’s summer schedule and reviewing the cupcake jobs we had coming up. Chilling with my best friends—Alexis, Katie, and Mia—and brainstorming. It was definitely going to be fun. A bunch of little kids streamed on and sat mostly in the front of the bus. Suddenly I spied a familiar shade of very bright blond hair, and my stomach sank. Noooo!!! It couldn’t be. Sydney Whitman, mean-girl extraordinaire and head of the imaginatively named Popular Girls Club at school, came strolling down the aisle, heading straight for the back row, where only the most popular kids dared to sit. I quickly looked out the window and pretended I hadn’t seen her. But no luck. “Oh, that’s so cute! You and your little brother sitting together! I guess that’s easier than trying to find someone your own age to sit with?” She smiled sweetly, but her remark stung just as it was meant to. Luckily, Jake turned to the window just in time and hurled the contents of his stomach out onto the road. “Disgusting!” shrieked Sydney, and she fled to the back of the bus. I didn’t know whether to laugh or cry. It’s just one more nail in the coffin of my possible popularity, not that I ever really stood a chance. And not that I really wanted to. But it was also kind of hilarious to have Jake take one look at Sydney and then throw up. Definitely not her desired effect on men. I made a mental note to tell the Cupcake Club later. They’d love this. Jake barfed a couple more times and then sat back down, looking as white as a sheet. The good news about Jake’s car sickness is that after he’s done throwing up, he’s always fine. I pulled a napkin from my lunch bag and gave it to him to wipe his face. Then I cracked open his thermos and gave him a tiny sip of apple juice. I felt sorry for the poor guy. I hate throwing up. I laughed. “I feel the same way when I see Sydney Whitman.” I wasn’t sure I would have been so psyched about going to this camp if I’d known Sydney was going—or at the very least that she’d be on my bus. It definitely put a cramp in my happiness. Jake rested his head back against the seat and promptly fell asleep. In a minute his head was resting, sweaty and heavy, against my shoulder. First days can be hard for anyone, especially little kids. At least tomorrow we wouldn’t have the same problem. I said a silent prayer that Sydney wasn’t in my group. At camp, we got off the bus and a crowd of cheering counselors with painted faces was there to greet us. My mom must’ve called ahead to tip off someone, because one really pretty counselor was holding up a sign, like people do at the airport. It read OFFICER JAKE TAYLOR. That at least allowed me to peel him off and hand him over to the counselor, so I could go with my group, Team Four, to our rally zone (whatever that was) at the arts-and-crafts center. The boys and girls have separate areas at camp, so I wouldn’t see Jake again all day, thank goodness. And thank goodness again, because Sydney headed off with Team Five in the opposite direction. I didn’t have a minute to review who was on whose team. Anyway, I didn’t know a lot of the kids, but I did know that wherever Alexis was, she and I would be together. (We requested it, and my mom promised me she had spoken with the camp director.) That’s all that matters. As I headed across the green lawn to the arts-and-crafts center, I heard someone calling my name. I turned, and, of course, it was Alexis! I had never been so happy to see her in all my life. “Thank goodness!” I cried, and threw my arms around her, like a shipwreck victim who has finally been saved. Alexis isn’t much for big displays of affection, so she patted my back awkwardly, but I didn’t mind. In any case, she just saw me a few days ago. “What’s going on?” she asked as we separated and followed our counselor. Alexis waved her hand in the air, as if to say whatever! That is just one of the many things I love about Alexis. She doesn’t care at all what other people think. “Too bad he didn’t puke on her,” she said with a laugh. “Or did he?” Her eyes twinkled mischievously. We’d reached the log cabin that was the headquarters for our team. On its porch stood two teenage counselors—a guy and a girl. As the crowd amassed in front of them, I counted twelve campers: all girls, of course. Yay! Finally! A break from all the boys in my life! “Hello, people! Listen up!” The guy counselor was clapping his hands and kind of dancing around in a funny way to get our attention. Everyone started laughing and listening. Maryanne did a little curtsy, and we all clapped. She was pretty—short and cute with red hair and freckles. Raoul was tall and thin with rubbery arms and legs, and his face had a big goofy smile topped off by black, crew-cut hair. It was obvious neither of them was shy. “We are going to have the most fun of any team this summer! Raoul and I personally guarantee it!” Maryanne said enthusiastically. There were cheers and claps. “Okay, we have a lot to tell you, so why don’t you all grab a seat on the grass and get ready to be pumped!” said Maryanne. Raoul and Maryanne then proceeded to tell us how we’d get to pick our own team name. (“Team Four” was just a placeholder, they said.) They told us about all the fun activities we’d do: swimming, kayaking, art projects, team sports, field trips, tennis, and more. Then they told us about the special occasions that were scheduled: Tie-Dye Day, Pajama Day, Costume Day, Crazy Hat Day, and finally, the best day of all … Camp Olympics, followed by the grand finale: the camp talent show! Ugh. The camp talent show? Getting onstage in front of more than a hundred people? So not up my alley. I made a face at Alexis, but she was listening thoughtfully, her head tilted to the side and her long reddish hair already escaping its headband. She was probably wondering if there was any money to be made here; business was mostly all she thought about. In fact, her parents said if she did an outdoor camp for part of the summer, she could go to business camp for two weeks at the end of the summer. Sometimes I wonder how we are friends at all; our interests are so different! “Thinking of signing up?” I whispered. “Myself? No. But you should,” she whispered back. Right. I can’t even keep the kid I babysit for from throwing up. 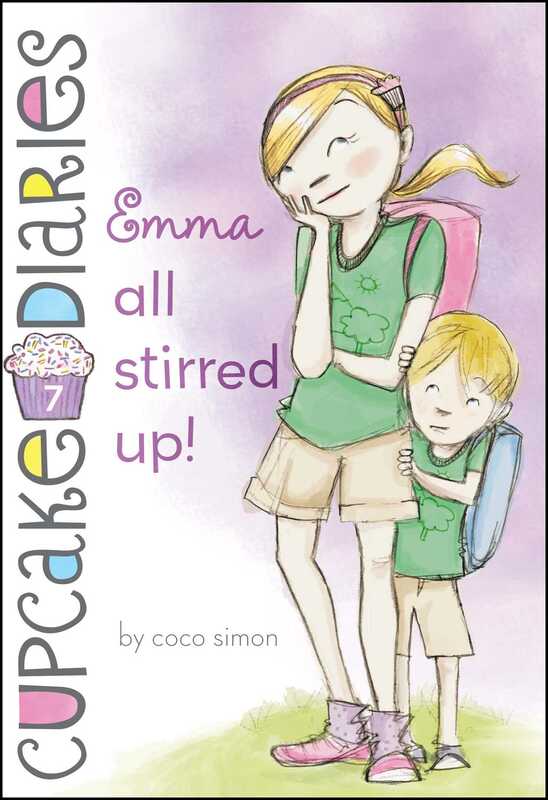 Book Cover Image (jpg): Emma All Stirred Up!